During the Korean War it was found that the swept wing MiG-15 was vastly superior to the US Navy's Panther and Banshee jet fighters and only the USAF's F-86 Sabre could match the MiG. The US Navy set out a requirement for a swept wing jet fighter based on the F-86. The result was the FJ-2, FJ-3 and FJ-4 Fury series of fighters. The FJ-2 was a modified F-86, with strengthened landing gear, arrestor hook and four 20mm cannons instead of machine guns. The FJ-2 was superior in performance to the other USN fighters but the extra weight meant it was not as good as the F-86, plus the landing gear still wasn't strong enough. The FJ-3 used a more powerful engine and ironed out the FJ-2's flaws. Finally the USN had a fighter to match the F-86 but it suffered from engine reliability issues. The FJ-4 was extensively redesigned with an even more powerful engine and new wing. Other features included more fuel tanks, less ammunition and a modified cockpit, all of which gave it more range. Most of the FJ-4's went to US Marine squadrons and it was never the main USN fighter as within several years both the more advanced F3H Demon and F-8 Crusader entered service. The FJ-4B was the fighter-bomber version of the Fury, which was strengthened to take 6000lbs of ordnance on 6 pylons. Hobby Boss are part of the Chinese model company, Trumpeter. Hobby Boss are known for their range of easy to build model kits for novice modellers but also for their range of nicely moulded and detailed, well engineered kits for a reasonable price. 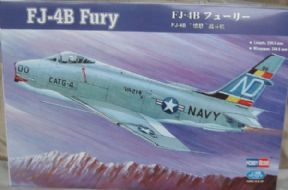 This Fury model falls into the latter category and looking at the contents of the box I think a nice looking model can be made from this kit. The kit comes with air to air and air to surface missiles. There are markings for 1 US Navy and 1 US Marine aircraft.